This article describes how to handle various situations in which students leave your school: graduations, withdrawals, discipline cases, and leaves of absence. After recording the exit, you may also want to consider whether to remove the student's user access. When a student is no longer a student at your school—whatever the reason may be—DO NOT DELETE THE STUDENT ROLE! Removing the student role from a person hides their academic information and removes it from reports, statistics, and other places where you'll wish to have it. Rather, SET THE STUDENT ROLE TO INACTIVE—this indicates that the person is no longer a student while also preserving all their historic academic information (and including it in reports, etc.). Click next to the degree you wish to grant and choose Edit Degree. Change the degree's status to granted. Check whether to make the student role inactive. Doing so will prevent further modification to her academic information, but will not affect her user status or other items in Populi (financial, library, etc.). 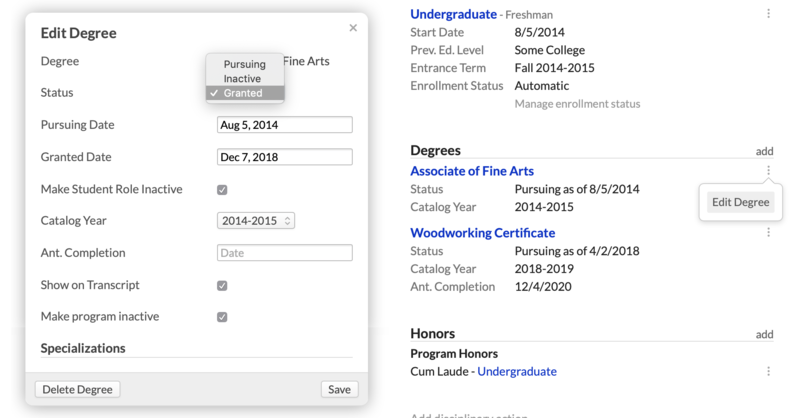 If she has a specialization connected to the degree, you can enter a completed date. The student is now an alumni and gets the corresponding system tag. The program connected with the degree becomes inactive (unless the student is still pursuing a degree in that program). The student's graduation date appears under that program as the Exit Date; the Exit Reason displays as graduated. The student role becomes inactive (if you checked to do so). The student's status is updated in various reports and statistics throughout Populi. To withdraw a student, you simply set their Student role to inactive. Click edit roles under the student's profile picture. Select an exit reason. These are the official IPEDS exit reasons and can't be customized. If you don't see the exact reason you'd like to add, select Unknown or Other. If the student is withdrawing for disciplinary reasons, see "Discipline cases", below. The student is withdrawn from all of her unfinalized courses. The student's programs and degrees become inactive. The exit date and exit reason under the program(s) are updated with your selections. Don't delete the student's profile! Inactive students don't cost your school anything, and it'll just make everyone's life harder if you delete them. Don't delete the student role! Only delete the student role if it was a mistake for the person to be listed as a student in the first place. If a student withdraws from a particular program, you can note that by editing the program details on her profile. Click next to the program you wish to change and choose Edit Program. Set the program status to Inactive. Edit any other pertinent fields. Any degrees in that program will be set to Inactive. If the student is leaving because of a disciplinary action, you can include a discipline record (in addition to withdrawing the student). 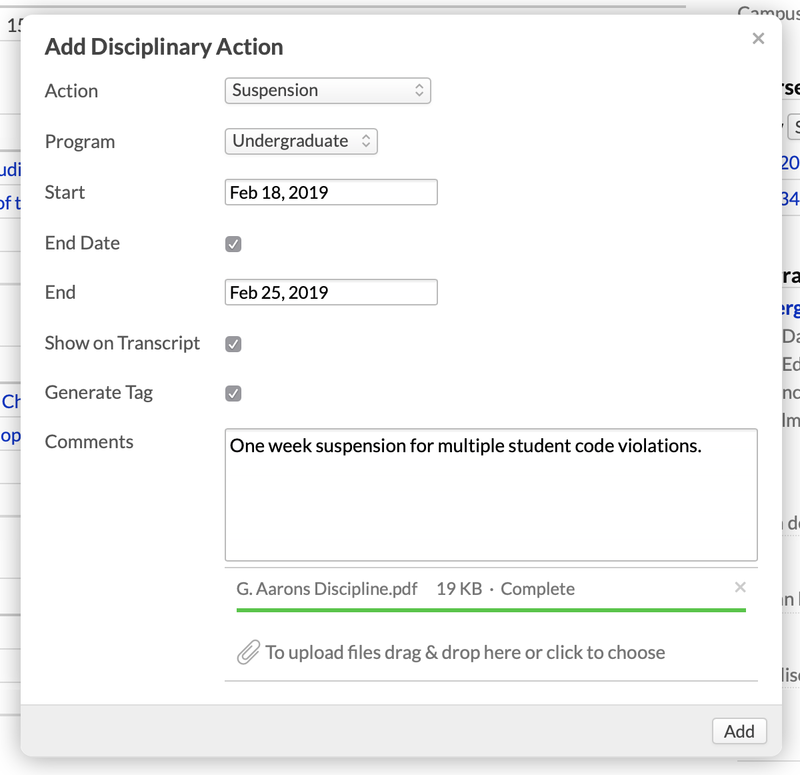 In the right column of the student's profile, click add a disciplinary action. Enter a start date. Check if there's an end date and enter that (Expulsion prompts you for a readmitted date). You can also add comments and attach files. When a student takes a leave of absence (LOA), she is temporarily pausing her studies with the intent to resume them within a certain timeframe. To properly record LOA and ensure it is included in the appropriate reports, use the built-in student information field. Check the box next to Leave of Absence. Enter the starting and anticipated return dates. To end a leave of absence, just un-check the box next to Leave of Absence. She'll have the Leave of Absence system tag. You can retrieve the student from the Data Slicer by searching for LOA Anticipated Return Date, Days Since LOA Start Date, and LOA Start Date. She'll be marked as LOA on the Clearinghouse report. Her Student role will remain active. If you set her Student role to inactive, that exit date/reason data will over-ride the LOA information. So, don't deactivate the Student role! If the LOA lasts longer than 180 days, certain financial aid regulations sometimes require that the student be listed as Withdrawn. Check the rules for any private, State, or Federal financial aid to see whether you should take any additional action. Academic Admins and Registrars will be notified by email when students are LOA for 60, 120, and 170 days. When you say it renders all academic info inaccessible is that inaccessible to the student, or to the school (i.e. academic admin, registrar, etc.) as well? Is this the same thing as "turning off" the student's e-mail, or is that a separate thing? It isn't. We don't have a way to "turn off" student email (that's something you could manage in Google Apps, I believe... which y'all aren't using at this time). The best way to remove the student's email access is to remove him as a user then add him right back in with the same username (he'll have to re-set his password, though). Doing this also deletes his old email. Thanks Brendan. I think I'll just give you guys a quick call. I'm trying to resolve an issue and create protocol for exiting students. Thanks again! It's always best to just hit us up at support@populiweb.com! Grade reports are one thing that students no longer have access to, once their status as student is made inactive. It seems that they could still have access to that without hurting anything. We had one class that added course comments after grades had been finalized and the term was wrapped up. I had inactivated all non-returning students and had to reactivate them in order to see their grade reports -- now I need to remember to deactivate them again within a reasonable amount of time. It would be so much nicer to not lose this option in the first place. Another reason not to turn it off would be for those students who are out of e-mail contact, or have no ability to print, say they are on vacation or honeymoon, etc. right after school ends. When they return and want to print, they can't.